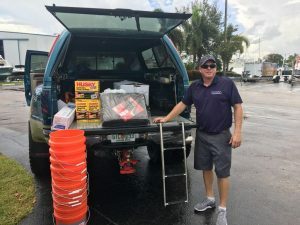 AYS heads south to help with hurricane relief after Irma hits hard : Atlantic Yacht & Ship, Inc.
All of us in South Florida were effected by the recent Hurricane Irma that came through town. Overall, at Atlantic Yacht & Ship, we survived with relative luck. Therefore, in the wake of the storm, we decided to do what we could to help out with hurricane relief. In the first place, the Florida Keys were struck the hardest. Together with their proximity to sea level the storm also hit them directly. 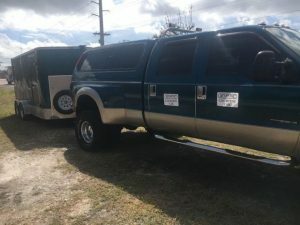 So, we loaded up one of our trucks and trailers, filled them to the brim with supplies, and headed south to help as we could with hurricane relief. Ordinarily, a drive down to the southern keys is one of the most beautiful drives the world. This time it was much less serene and beautiful than normal. There was major destruction. But, as we have done before, Florida will rebuild. The one beautiful thing was how many people were coming together as part of hurricane relief. There are lots of people even now lending a hand to clean up and rebuild. Countless companies and families have donated time and goods to help. In fact, Florida will be back up and running for our popular winter season!